Located on the border of bustling Bury St Edmunds, these modern first floor office blocks are available on flexible lease terms. 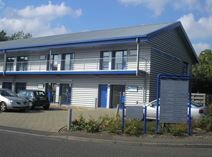 The building is close to the A14 and offers on-site parking, making the centre easily accessible by car. There are popular bus routes running nearby for those who prefer to travel on public transport. The centre offers open plan offices, meeting rooms and kitchen facilities. Set in this historic market town, and close to shops and good public transport links, this centre is housed in an Edwardian building and provides a variety of serviced office spaces, along with a range of business support services. A Grade II listed building bordering Bury St. Edmunds town centre, retaining many original features including a stone fireplace in the charming reception. All the various sized offices are carpeted, have secure wireless network access and are available with or without furniture. Full reception, mail and secretarial support are offered. Situated close to the train station, with connections to Cambridge, Ipswich and London, and the A14.